I double this recipe and put it in a heart-shaped silicone baking mold for Valentine’s Day! I prefer using silicone baking molds as it is easier to pop right out of the mold without having to use a cooking/baking spray. Combine chocolate chips, sweetened condensed milk, butter, peppermint extract, and salt in a large microwave-safe bowl. Heat in the microwave on medium-high until chips are melted, 5 to 6 minutes, stirring every 2 minutes. 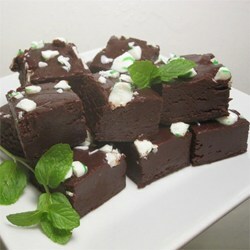 Pour chocolate mixture into an 8×8-inch silicone baking dish; top with crushed peppermint candies. Lightly press candies, using the back of a spoon, into chocolate mixture. Refrigerate until set, 1 hour.